Discordant Harmony is a critical response to the notion of “harmony”, which serves as an ascription for a rather stereotyped and reductionist notion of Asia. Four curators, Chien-Hung Huang, Sunjung Kim, Yukie Kamiya and Carol Yinghua Lu, from Taiwan, Korea, Japan and China have placed the understanding and discussion of art, ideas and histories of the respective regions in a larger context, researching into the multiple historical and contemporary layers of meaning on the construct of Asia. Initiated by the Goethe-Institut in East Asia, this touring exhibition started from Seoul, traveled to Hiroshima and Taipei, before coming to the last stop at the Beijing Inside-Out Art Museum. Each episode of the exhibition series has addressed specific issues raised by each new context, bringing the most current thinking into this evolving project. It leads to this new version in Beijing, focusing on the period between the late 1980s and early 1990s, when a critical turn took place in East Asia. During those years, those living in East Asia not only witnessed the end of the Cold War and indeed felt its impact, including increasing globalization, but also experienced the profound transformation within the societies, political systems, economies and cultures, along with new challenges and opportunities. The four curators have selected particular exhibition projects and art events of that time as case studies, to examine and represent the complexities of that era. In this way, we may better understand how the art and thoughts of those important years have continued to influence us today and relate to each other across these regions. Chien-Hung Huang, in his section “Temporary Finitude: A Bio-Revolution Initiated by Individuals”, presents the practices of three artists, Chen Chieh-Jen, Su Yu-Hsien and Chang Wen-Hsuan. 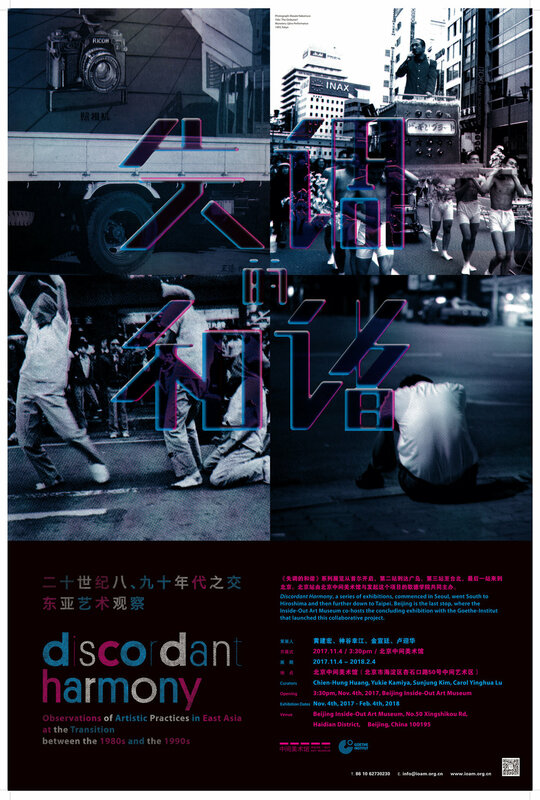 He intends to prompt the viewers to consider their resistance to, contemplation of, leap over and suspension of thinking towards the nihilism in the information and consumer society, and to grasp the appearance of the exiles and survivors in the history of Taiwan in the 1980s and 1990s. Sunjung Kim, in her section “At the Moment of Encountering the International”, revisits the exhibition Plastic Spring curated by Yongwoo Lee and Hyun Do Kim. The purpose of this epoch-making exhibition was to keep a distance from the popular “political art” and the trend against “art for art’s sake”, and to find artists who created fresh visual language. It empowered the Korean artists and their works to connect with a broader international context. Some of the works are on show in this exhibition in Beijing. Yukie Kamiya brings “Street as a New Platform for Art – Japanese Alternative Art Scene in the 1990s”, in which she focuses on two art events that took place on Japanese streets, The Ginburart and Shinjuku Shonen Art, whose participants were young Japanese artists who were active in the 1990s. The time saw the massive building of museums under the economic boom in Japan, but the young artists were often excluded from the overseas exhibitions. Frustrated by this, they spontaneously began the critique of the gallery system and initiated participatory art and curatorial practices. Carol Yinghua Lu curated the Chinese section titled “Prophecy at the turn of the 1990s”. Starting from the mid-1980s and focusing on four case studies – Fine Arts in China (1985-1989), The New Generation Art Exhibition (Beijing, 1991), Garage Show (Shanghai, 1991) and The First 1990s' Biennial Art Fair (The Oil Painting Section) (or Guangzhou Biennale, Guangzhou, 1992), this section delineates the period in rough strokes as a start for recognizing and analysing the prophecy embedded in that period in China's art world. These four sections are intertwined in the exhibition, so as to enrich our knowledge and imagination about the connection and difference between the four regions during that time. Artists: Chen Chieh-Jen (TW), Su Yu-Hsien (TW), Chang Wen-Hsuan (TW), Cho Duck Hyun (KR), Choi Jeong Hwa (KR), Heejung Kang (KR), Lee Bul (KR), E J-Yong (KR), Yoon Dongchun (KR), Kazuhiko Hachiya (JP), Tsuyoshi Ozawa (JP), Masato Nakamura (JP), Chen Shuxia (CN), Gu Dexin (CN), Hu Jianping (CN), Liu Qinghe (CN), Ni Haifeng (CN), Wang Guangyi (CN), Wang Hao (CN), Wang Jinsong (CN), Wang Luyan (CN), Zhan Wang (CN).